GENERAL DESCRIPTION The TDA7000 is a monolithic integrated circuit for mono FM portable radios or receivers where a minimum on peripheral components is important (small dimensions and low costs). 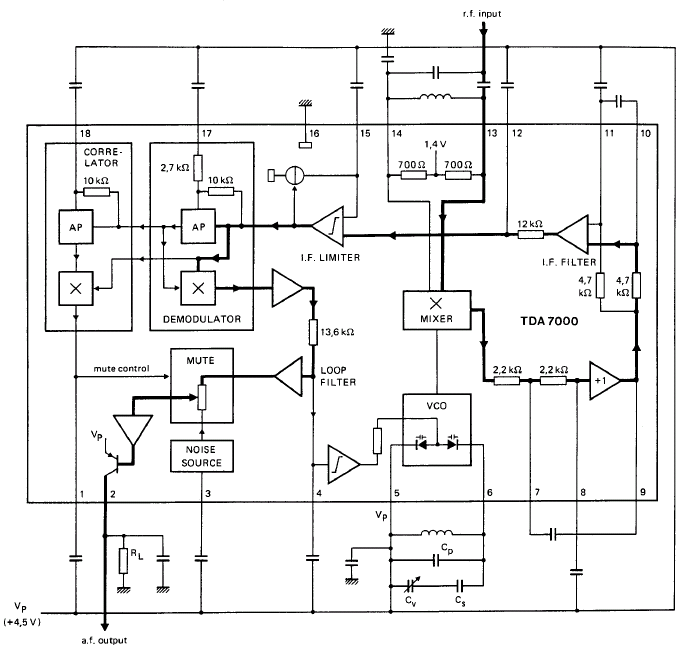 The IC has an FLL (Frequency-Locked-Loop) system with an intermediate frequency of 70 kHz. The i.f. selectivity is obtained by active RC filters. The only function which needs alignment is the resonant circuit for the oscillator, thus selecting the reception frequency. Spurious reception is avoided by means of a mute circuit, which also eliminates too noisy input signals. Special precautions are taken to meet the radiation requirements. 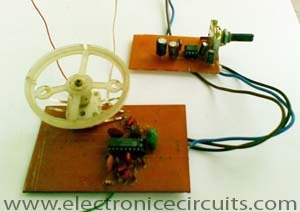 This circuit is typical using with a LM386 for the audio power amplifier. With a minimum on peripheral components we can build a high performance and small FM radio receiver . 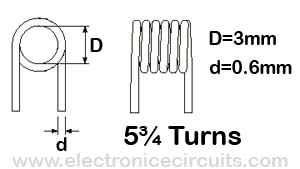 L1:Tuning Coil, 5¾ (5.75) Turns of 23 swg enamelled copper wire close-wound on a 3mm diameter. L2: Antenna Coil, 4¾ (4.75) Turns of 23 swg enamelled copper wire close-wound on a 3mm diameter. 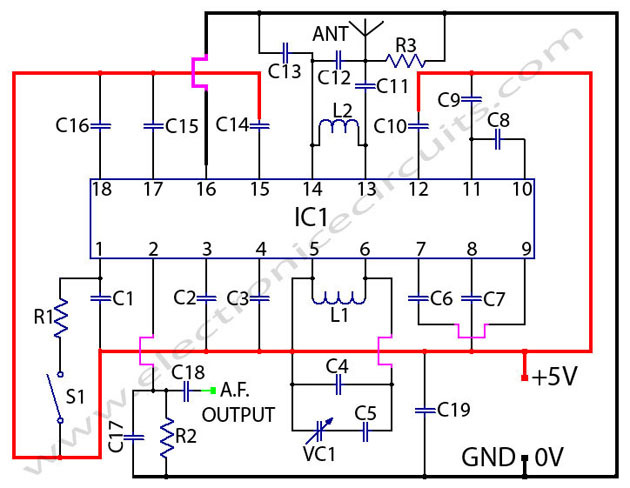 Hello there, i am attempting this circuit, and i have a few questions. 2) have you placed any errors purposely to stop reproduction of this circuit?? can I use a normal capacitor with a range between 15 and 30 pF as explained above as tuning capacitor? so without using the one you put in this circuit. what are the materials of the capacitors? how can we receive signals? we can’t even have one. and is that fine we took out the mute switch? Will this circuit work on 9 V battery? the aircraft band (118 – 136 MHz ) ? NO!. Airband is AM not FM. i turned tda 7088t into vhf radio up to 150 mhz by only adjusting the osc coil up to 9 turns . and removing the 18p capacicitor in parrallel with vc .make antenna more than 1m vertical . l’autoradio VOXON TANGA FM montava l’integrato TDA7000 ? Forget the aircraft band, that is AM and this chip is for FM so listening to aircraft’s on AM is out the question. The chip will work on 27Mhz FM but the selectivity will be wider because CB on 27Mhz is 5Khz wide…. meaning you might be hearing more than on station at once. The chip will work merrily on 9V but I would not go anything higher…. 6V is about the norm I would say. 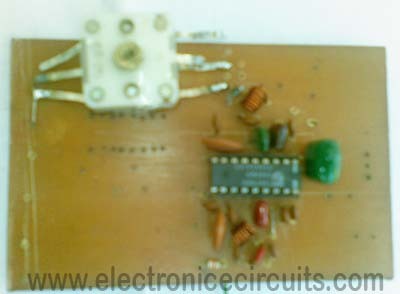 At VHF earthing is very important it is preferable the circuit is built on a PCB rather than vero board. The mute switch is only a feature and may be left in circuit or out of circuit OR the mute enabled or disabled – up to the user. The I.F frequency is 75KhZ so the oscillator would need to be tuned 75KhZ above the wanted frequency (or frequency range). There is no exact calculation to determine L and C for other frequencies, this may be had from radio handbooks or coil data sheets such as Toko or Spectrum coils….. experiment is usually required here without test equipment. Good quality can be got from this chip but don’t expect good selectivity performance compared to a proper FM receiver with their 10.7Mhz IF frequencies, the IF frequency in this chip is only 75Khz!!!!! Thought I’d try and clarify one or two points. 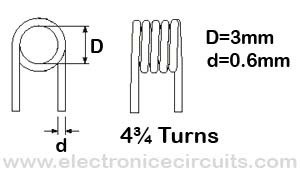 hello, can i use #22 solid wire in inductor? if yes how many turns? im really, not good in inductors.